CCH's Elements of Government Contracting combines two previous books, Elements of Contract Formation and Elements of Contract Administration , to make one comprehensive resource. Thiss convenient reference covers the entire procurement spectrum from the beginning of the process through claims and disputes in a straightforward, easy-to-read manner. 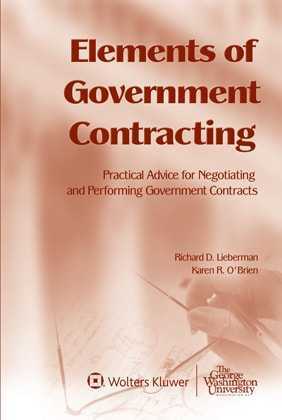 The first part of this book explains the important elements and issues involved in the formation of government contracts, including the two primary methods of contracting. The next part addresses the factors critical to contract inception, performance and completion, and outlines the rules for contractors in the administration of a government contract. Elements of Government Contracting includes sample letters to contracting officers, as well as practical tips at the end of each chapter. In addition, it has an appendix on how to get a Multiple Award Schedule Contract and avoid pitfalls in performance.